The business district along Adams Avenue is in a constant state of change. 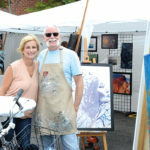 Highlighting the ever-growing vibrancy of the neighborhood, the 11th Annual Art Around Adams, which took place on June 7, provided the perfect opportunity for each business to showcase its eclectic personality. From early afternoon until well past the sun’s setting, the avenue bustled with art, music and dance performances. Pedestrians moved from block to block to hear the music and see the sights. There was far too much occurring on the sidelines of Adams Avenue for a single bystander to witness, but a few happenings stood out. The Schitzophonics — headlining the Blindspot Records stage at Smitty’s Service Station — had the audience in the streets moving and grooving. The Satanic Puppeteer Orchestra amused and delighted with their CD release party at the Adams Avenue Car Wash Stage. At Adams Avenue Integrative Health, acrobatic yoga artists fascinated passersby. Art Kids of San Diego painted electrical boxes. At the Book Tree, people stopped to watch artists painting en plaine aire. Jesse Lee Chase particularly admired the “mesmerizing” work of Rory Canfield, who was working on an abstract in acrylics. A man with his daughter stopped for a moment to watch him work on the painting. “People in this area enjoy the creative process,” Canfield said. 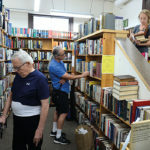 John Tice, owner of Book Tree, had called on event organizer Johnny Tran to locate artists best representing the businesses and personality of the avenue. Tice moved his bookstore to Adams Avenue in 2005. Event organizer Adam Rosen paired up with Tran in recent years to plan Art Around Adams. “[Tran] seeks out both well established and new artists and curates the art to fit the impromptu galleries that form within the businesses involved in the event,” explained Rosen. At the event, when people had their eye-full of painting delights, they could move on to the palette of music and dance elsewhere. 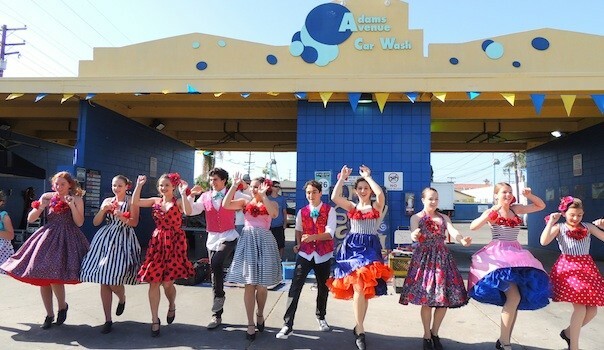 Young dancers from the San Diego Junior Theater entertained everyone with their swing dance performance in front of the car wash. Afterwards, Rayme Sciaroni, artistic director of Junior Theater, said it was the first time that the group had performed for the event. Laura Hodge of San Diego Creative Arts Project, located on 30th right off of Adams Ave, had several youth groups doing creative performances. Hodge paired up with Lindsey Lawlor’s giant robotic giraffe. Art Around Adams started in 2004 as a much smaller and simpler shadow of its current form, explained Rosen. It has grown from a few blocks to a two-mile stretch. 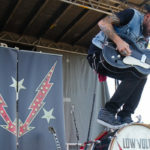 “The event has always focused on getting the public out to explore the community and build a relationship with the businesses that make up that area, through art, music, and whatever other eclectic performance we can throw at it,” Rosen said. As the oldest business district in San Diego, other than Old Town, Adams Avenue has seen the most change of them all. “I like to compare it to the way Greenwich Village used to be in the old days. Our Avenue has become legendary. 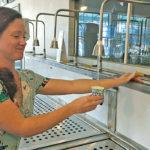 And this event really helps it,” Tice said. I enjoyed this article – it gives a good description of the all that is good about this event. I think anyone who reads it that hasn’t been there before will want to go next year..